Euro 2016: Are Spain over their World Cup hangover? 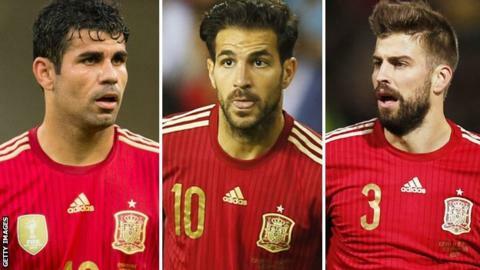 What does the future hold for Diego Costa, Cesc Fabregas and Gerard Pique in the Spain squad? Despite a solid record in qualifying of nine wins from 10 games, European champions Spain are facing several dilemmas as they prepare for the defence of their title in France next summer. Veteran coach Vicente del Bosque faces selection problems in several areas, and there is also a more general concern over La Roja's playing style as they continue to address the lingering hangover from last summer's World Cup finals campaign, where they made a shock group-stage exit. Going into Friday's friendly with England, these are the main issues. The biggest decision facing Del Bosque is the identity of his team's centre forward, because Chelsea striker Diego Costa has made a wretched start to his international career since being persuaded to switch allegiances from his native Brazil. But there are also plenty more alternatives and, within Spain, Del Bosque came under heavy pressure before the latest squad announcement to include popular Athletic Bilbao striker Aritz Aduriz, who has scored 15 goals in all competitions this season - a stark contrast to out-of-form Costa's paltry tally of three. But Del Bosque resisted those calls, saying the team is in a transitional mode and that he is also thinking about the future. In other words, he believes 34-year-old Aduriz is too old. Costa, however, is running out of time to justify his ongoing inclusion. As an indication of the national mood, a poll of readers conducted by Spanish newspaper Marca after the last set of international fixtures saw him omitted from the squad, never mind the starting XI. So, although it is only a friendly, Costa is in desperate need of a goal or two on Friday night. It all stems from two things. Firstly, Pique is regarded as the biggest pro-Barca cheerleader in his team's rivalry with Real, and enraged fans from the capital city by light-heartedly mocking the collapse of their title challenge during Barca's trophy celebration party at the end of last season. Secondly, Pique has been a vocal supporter of the Catalan independence campaign, leading to inevitable suggestions that he should not play for Spain if he is so keen for his region to break away and form a new nation. Those two factors have conspired to make Pique public enemy number one for proud and patriotic Spaniards who also support Real Madrid - which is millions of people in a country where the big two enjoy enormous support even in provincial towns. Pique's every touch of the ball has been mercilessly jeered in Spain's recent home games, and initial plans to stage Friday's game at Real's Bernabeu were scrapped to avoid the controversy of 80,000 rabid Madridistas venting their fury at the defender throughout a fixture which comes just one weekend before a Clasico at the same venue. Long-serving captain and Del Bosque favourite Iker Casillas is facing stiff competition from Manchester United keeper David de Gea. Calls for De Gea to be installed as first choice grew after Spain's most recent international, where he made several outstanding saves to preserve a 1-0 victory over Ukraine. But he was only playing in that game because Casillas was being rested with qualification already guaranteed, and the extremely loyal Del Bosque has shown no inclination of calling time upon his captain's international career. Indeed, he kept faith with Casillas even when he was left out of the Real Madrid starting XI in the build-up to the 2014 World Cup, and still did not waver when the keeper endured a horror show in the embarrassing 5-1 defeat by the Netherlands in Brazil. With Casillas making a decent start to his new life at Porto following his summer transfer, Del Bosque has no reason to be forced into a move that he clearly does not want to make, and De Gea will probably have to wait until at least next season to become Spain's first choice. But the microscope is firmly on Casillas, and another error-strewn performance like the one he produced against the Netherlands would rapidly intensify the pressure to promote De Gea. The lynchpin of Spain's midfield is the magnificent Sergio Busquets, who provides protection to Pique and Ramos as well as initiating many attacking moves from his 'pivot' defensive midfield position. The Barcelona man played more minutes than anyone else during qualifying. In front of him, however, Del Bosque is ridiculously spoilt for choice with a wealth of hugely talented players at his disposal, and the identity of the starters is by no means clear. Consider this list: Andres Iniesta, Cesc Fabregas, Juan Mata, Santi Cazorla, Isco, Koke and Thiago Alcantara (and that's just the current squad, never mind other contenders such as the injured David Silva, Villarreal captain Bruno Soriano and Manchester United's Ander Herrera). They would all walk into practically any other international line-up, but only four of them can start for Spain - and only three if the coach continues to opt for Pedro, one of his most favoured players, as a winger. If fit, Iniesta and Silva are certain starters, but the other two places remain up for grabs over the next few months, with all the contenders starting at some stage during the qualifying campaign. And Del Bosque's task in choosing between his dazzling array of midfield talent is further complicated by the fact that most of them can play in several positions. A nice problem to have, indeed. Never mind their qualifying record - Spain's confidence is still fragile after the battering they took in last summer's World Cup finals, a traumatic experience which has certainly not been forgotten. The upcoming games against England and Belgium will be seen as an interesting test of the team's capabilities against stronger nations, because in the last 14 months they have played friendlies against France, Germany and the Netherlands and lost all three without scoring. At heart, it is a question of identity. The Spain team is much changed from the side which dominated the world with three consecutive major trophies in 2008, 2010 and 2012, with the international retirement of Carles Puyol, Xabi Alonso, David Villa and, above all, the chief on-field conductor, Xavi. With Xavi pulling the strings, Del Bosque's old team was largely based upon mimicking the playing approach of Barcelona, who were almost equally dominant in club football during the same era. But Barca have tactically moved on since then, with Lionel Messi ditching his 'false nine' position and the midfield-reliant methods of so-called tiki-taka being somewhat abandoned in favour of a more direct approach, based around the forward line of Messi, Luis Suarez and Neymar. Spain have not made such an evolution, and there are major concerns that Del Bosque remains too wedded to an old playing style which worked brilliantly at its peak but has now become outdated and can be countered by high-quality opposition. His inclusion of Costa, indeed, is an attempt to add a greater degree of physicality, but so far it has not worked because the rest of the team is continuing to pursue a different style of play. A convincing victory over England would help persuade fans that Del Bosque and his players can still pull off their old tricks - but a draw, or worse, would sow fresh seeds of doubt into a team which is facing many question marks.